This is probably the ultimate survival capsule. The Delta is a modular survival capsule that includes 3 modules and some end caps to allow multiple configurations. The main module is a classic hollow survival capsule module, it has a small compartment in one end that can be used to store a button compass or some medication. The second module is a whistle and also has the pocket clip, the whistle is quite loud and waterproof. The third module is a locator module with a tritium tube inside. One of the caps has a hole for a lanyard, the other is a plain cap and there is another one with a crenelated end that can be used as an impact cap. The capsule is compatible with TAD's gear cheaper "tactical" capsule and there is an optional cap that can be purchased to use xacto cutters. If you buy both capsules you can play lego with them but unfortunately the colors don't match. You can use your delta in several different configurations, maybe some extra caps or accesories would have made this even more modular than it is and the TAD guys may be planning to release extra modules or caps in a near future, the x-acto end cap is a positive sign in that direction. The price is $148. You can find more info or get it from TAD Gear. 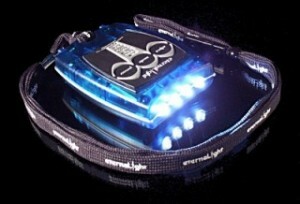 Eternalights are very special flashlights, here we present their top of the line model: The EliteMax 4Z. By pressing the mode button you cycle through the different modes that the light has, in some modes you can use the adjust button to change settings for that mode. So let's start describing the different modes. The first mode is constant on, using the adjust button you can change the brightness level there are many many different brightness levels from the 4 leds at maximum power to just one led in a very dim mode or even just the blue locator LED on for insane runtime (months). The second mode is a flash mode, the lights blink, the blinking speed can be selected using the adjust button. Then you have the strobe and the strobe speed can be selected using the adjust button. Then you have dazzle mode, where the light goes from dim to bright then flashes and the cycle is repeated, great to attract attention. The next mode is SOS mode and finally you have a momentary on/off mode. If you think this is great there is a lot more to say. From the off mode pushing the adjust button produces a burst mode of maximum power, great!. There is also a locator flash that can be activated, this makes a blue led inside the casing blink every 2 seconds this can be left permanently on if you want to locate the light in the dark. The locator can be configured to be permanently on instead of blinking. The light is regulated, this means the output is the same regardless of the battery consumption. But not only that, you can actually program the regulation to be on or off, without regulation the light will run longer but will get dimmer as the batteries get drained. The light is powered by 3 lithium AA batteries, it is shockproff and waterproof and as long as the batteries are lithiums it will float. You can configure many things, for example a "simple" mode where the interface is simplified. Finally you have a mode to test the battery level indicating with the 4 leds the status of the batteries. 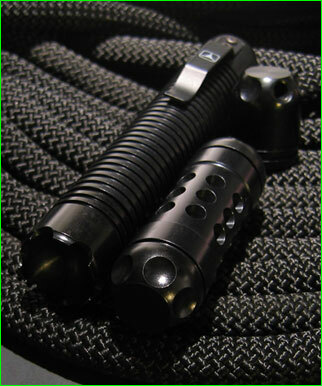 This is a fantastic and advanced flashlight for many different purposes. A great companion and probably the best survival flashlight ever built. You can find more information in Eternlight's website. Retail price is about $75.